All-New All-Different UNCANNY AVENGERS #1: The Drama Squad! In the newest iteration of the Avengers “Unity Squad,” we are treated to an even more diverse lineup with the addition of Inhumans. As the cover suggests, the new “Unity Squad” includes the still-geriatric Steve Rogers, the Human Torch, Spider-Man, Dr. Voodoo, Rogue, Deadpool, Quicksilver, and a brand-new Inhuman codenamed Synapse. 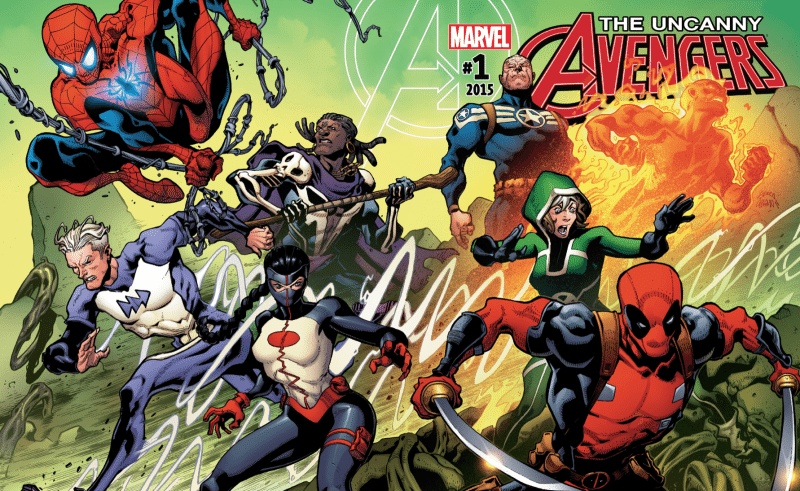 From the first glimpse at the All-New All-Different Marvel Uncanny Avengers lineup, you may have thought the volatile natures of these vastly different characters would cause serious problems – and you would be correct. As with a good number of books containing brand new teams, UNCANNY AVENGERS #1 focuses on the characters and team dynamics. 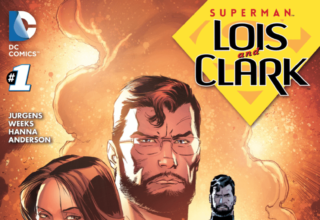 In common with Rick Remender’s two series, this team seems to have more issues than most. 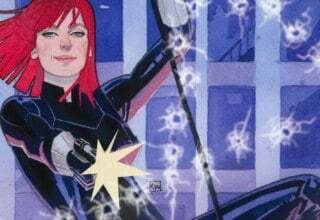 With Inhumans, mutants, and “traditional” heroes united, this first issue is full of tension; it’s not heavy-handed, however, which is always a danger in an issue of this type. There’s an immediate fissure within the team’s ranks, with Spider-Man quiting after some… questionable decisions made by Deadpool. It’s no surprise that Spider-Man isn’t the only cast-member who objects to Deadpool’s presence, but the “merc with a mouth” plays a key role, using his All-New All-Different popularity to fund the Uncanny Avengers (even if they’re having to make do with what they have, including being based at an old speakeasy). And Deadpool’s hardly the biggest roadblock to the squad’s supposed “unity”. Take Synapse. 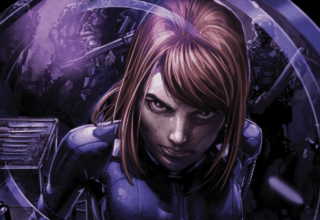 There’s been no end of speculation as to who was under that mask; but while a large number of fans suspected she was Daisy Johnson’s “Quake”, it turns out she’s a new superhero making her first appearance in these very pages. While her powerset remains vague, dialogue throughout the issue implies that she has the ability to affect the motor-functions of living things by manipulating their nervous system. I found this to be a welcome variation of the typical mind-control power exhibited by so many comic book characters. I appreciate the new Inhuman characters in part because their powers seem so scientifically thought-out. HUNGRY FOR MORE ALL-NEW ALL-DIFFERENT MARVEL? WE’VE GOT SAM WILSON: CAPTAIN AMERICA #1 HERE WAITING FOR YA! On the other hand, there’s Rogue, her body suffering due to the Terrigen Mists. Duggan gets straight to the point here; keeping true to Rogue’s well-established character, he avoids passive-aggression completely, leaving Rogue as the representative of a species on the brink of extinction, and she doesn’t care who knows it. The mutants being sterilized and thusly slowly eradicated by the Terrigen Mist makes me feel that Steve Rogers will be due yet another medal if he can make these people function together. This dysfunctional family is portrayed well without being forced. Honestly, it’s the reality of such relationships which make this issue one of the most ensemble-driven Avengers titles I’ve seen since the original New Avengers. Gerry Duggan has written this first-issue in the form of a cinematic team montage. Approaching the job from this angle has created a smooth sequence of events which for many writers could have appeared disjointed and confusing. 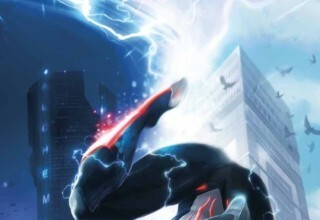 Ryan Stegman not only brings this story to our eyeballs with energy and momentum, but once again gains some serious character design cred with new costumes for Human Torch, Quicksilver, and Synapse (and a new baddie); each of these give clear visual differentiation in action sequences, also leaving room for intricate characterization. Think about how many times they’ve tried to make Quicksilver’s costume relevant. He’s always had that lightning bolt motif, and now following Pietro’s realization that he is not, in fact, Magneto’s son, I find it understandable to try something new. The new “fast-forward” symbol is a good way to do that. 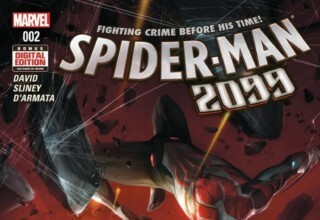 I’m just anxious to see how his powers are handled in this book. Quicksilver moves fast, but that’s about all writers seem to have been able to agree on. 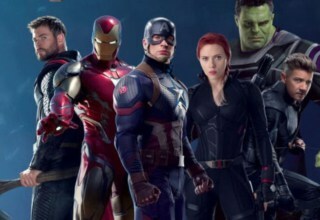 In addition, take a step back and look at ALL the new costumes; Marvel seems to be making a decisive move back toward classic superhero looks. If the colors aren’t evidence enough, seeing the icons on everyone’s chests make it clear as crystal (for me, at least). 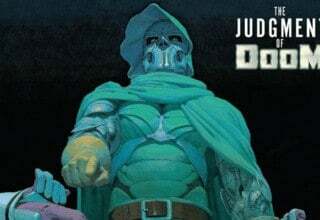 We have a dynamite setup, good characters and great art. With all those factors present, I’m already itching for the next issue! DON’T MISS MORE FROM JACOB!